Any evidence or feedback on these high end rust paints vs the rust oleum rattle cans? 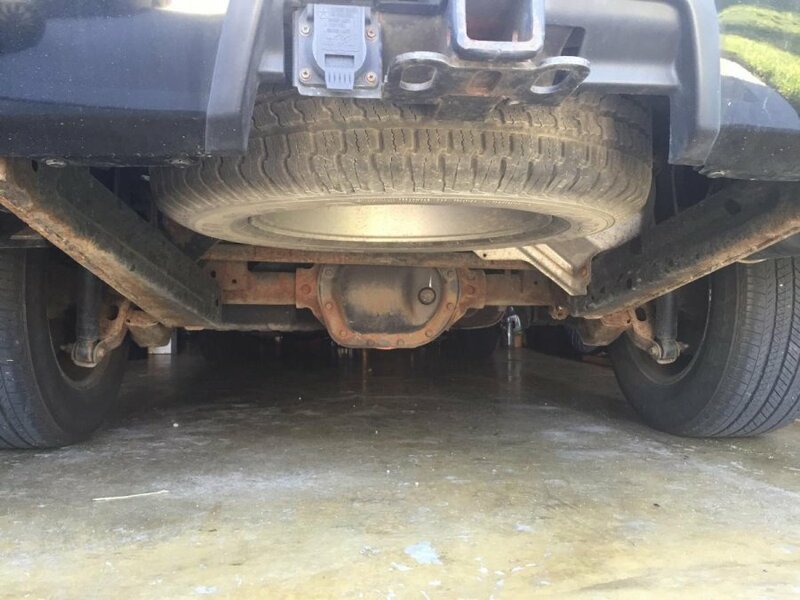 I want to clean up the rusty undercarriage of my WK. Im not 100% sure a decent on-vehicle sand blast/wire brush and some spray paint is just as effective considering cost and time. Eastwood has a decent video or two on a TJ frame on refurbish (with their products of course). Personally, having done an frame-on sandblast...I wouldn't. You will likely contaminate things you don't mean to. The most challenging part of a refurbish will be the inside of the frame. Get a good product (NOT Rustoleum) and method to chemically encapsulate and prevent rust there first. Those products run and can ruin your outside paint work. Now have a go with a good wire brush and/or flapper-disc, and solvent cleaner. The quality and life of your selected finish will mostly depend on your prep. Oil-based Rustoleum primer (NOT water-based) is decent stuff, and applied over proper prep even if rattle-canned, will last years and years with touch-up for dings. However, the acrylic, lacquer, and enamel top coats aren't long-term UV stable and will fade, degrade, oxidize, and need re-coating periodically to maintain the barrier to rust-through. POR-15 is made for application OVER rust, which is very useful for areas you can't clean well. It will bond to bare metals as well as rust, but I think specific chassis paints do better on clean metal as they usually call for a primer/topcoat. Ive used rattlecan rustolem and didnt last well. The rustollrn in qt can is oil based and lasts longer. However need spray gun to apply. That said, here in Michigan you still need to touch up every year. As far as inside frame ive used motor oil or trans fluid. It stops rust but is messy. Used on my truck o can have a rust free vehicle for 15+ years. As part of my "Rust Retardation Program" I am big on POR 15. On rusty metal it works great even with minimal prep as per the instructions. I feel that prep is much more important on the cleaner metal. I have used it on a bunch of cleaner metal. Skid plates, tow hooks and brakets, the metal supports under my factory running boards, and the like. I wire wheeled it, cleaned with Purple Power, and prepped with their Metal Prep for longer then the instructions say. Jury is still out on the cleaner metal things I have done but at the moment thinking so far so good. Thinking for cleaner metal there are probably better choices though. I tried the Eastwood Internal Frame Coating for inside the uni-body. Have no idea if it helped. Last is Fluid Film. I power wash under the Jeep and inside the uni-body in October for the winter. They use that crap on the roads where I live. Then I go to town with the Fluid Film. Inside the uni-body and underneath. Every April I wash it off. That is when I will take a look at all the cleaner metal that I have POR 15'ed to see how well it has held up. Whatever you use I recomend putting fluid film over the top of it, like if you fix the rust the use por15 or ristoleum. Another thing about Fluid Film is that it appears to "condition" metal. When I first bought my '00 XJ and was playing with the POR 15 I noticed that my steering knuckles and other parts on my front diff were a rust red. Nothing crazy. It was October at that time and was the first year I was going to try Fluid Film. Well figured come April I would wash off the Fluid Film and hit the steering knuckles and whatnot with some POR 15. But when I power washed off all the Fluid Film I noticed that those parts were now a more mud brown. I never did POR 15 them. Future Mods: The usual upgraded axles, a T18 maybe a double stick for the D20 and OME YJ spring kit. I'm getting ready to clean up the frame on my CJ5 and undercoat the tub. Was thinking about bedliner for the undercoating of the tub but I have mixed feelings about it. I have no idea what to do with the frame. It's in great shape and I'd like to keep it that way. What sort of prep would you do to the inside of the frame and how should it be done? I would NOT use bedliner or any rubberized product on the underside of a vehicle. It will allow moisture to travel under the coating anywhere there is a void letting the water/icemelt/salt to sit there causing more damage. paint or POR or Eastwood coatings will work much better. Great responses, thank you for tips. I think I’ll just wire brush the loose rust, hit it with some rust oleum semi gloss and fluid film it after the paint cures. If I get a year or two out of that effort I’ll be happy.